The Pape Nature Park in south-western Latvia opened in 2003 with the ambition of protecting the region’s wetlands. 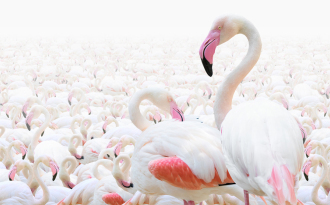 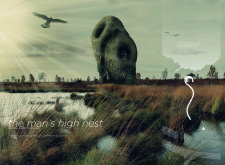 The nearly-11,000-hectare park includes important nesting grounds for 250 species of migrating birds within the marshes situated at the limit between the Papes Lake and the sea. 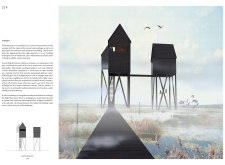 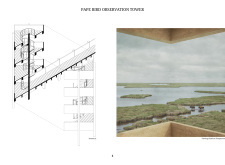 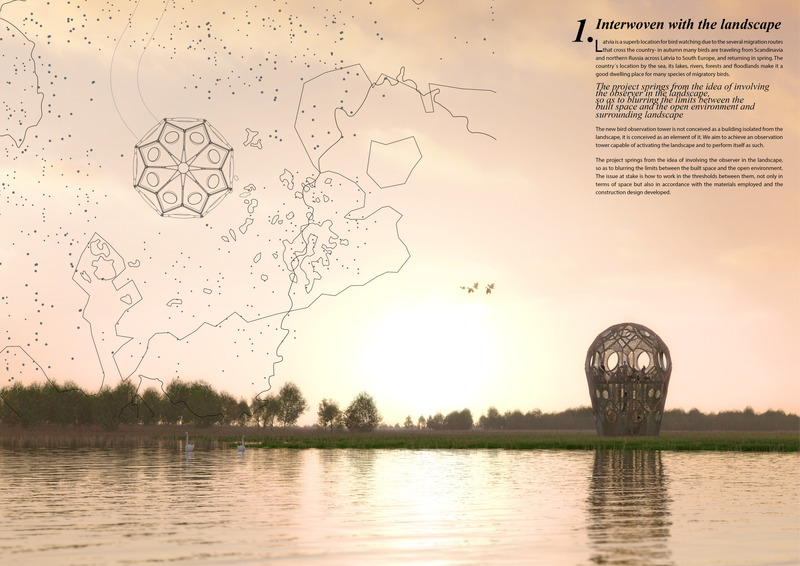 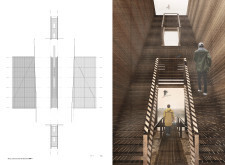 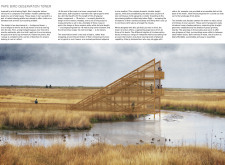 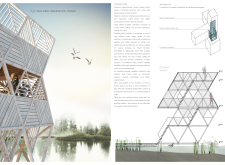 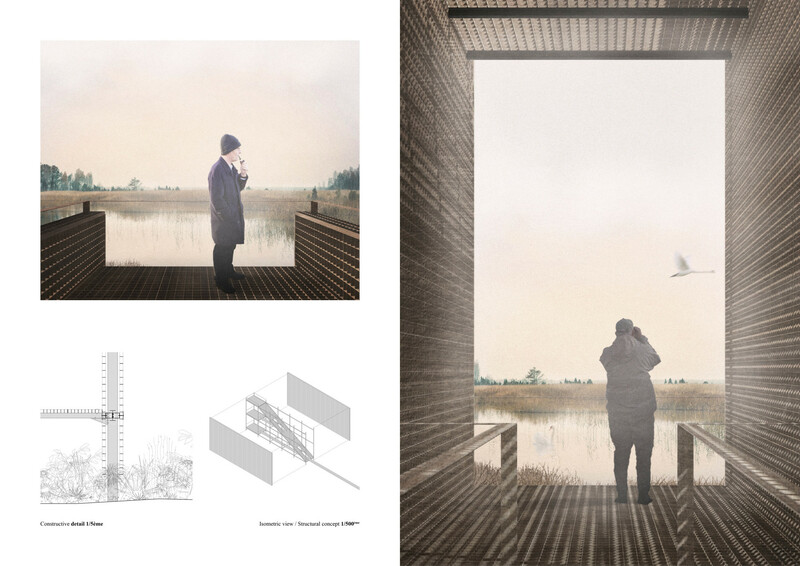 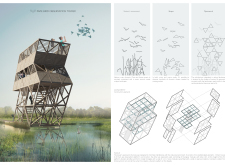 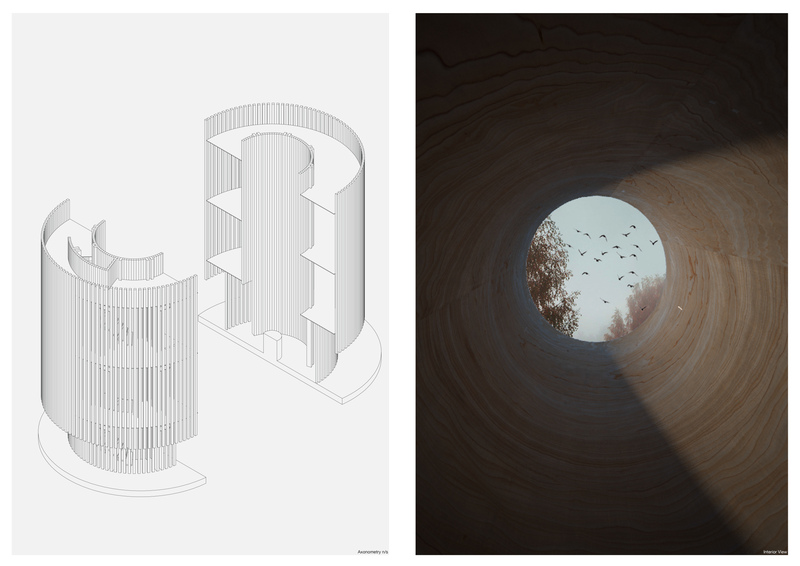 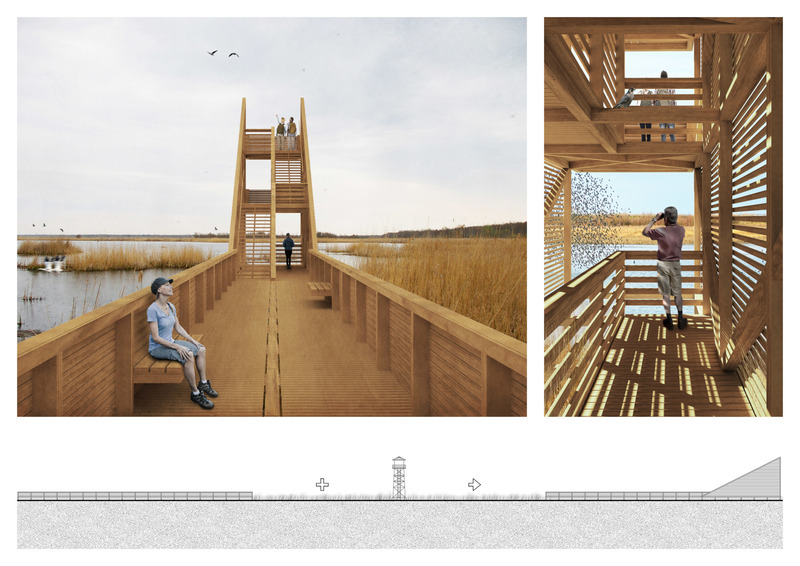 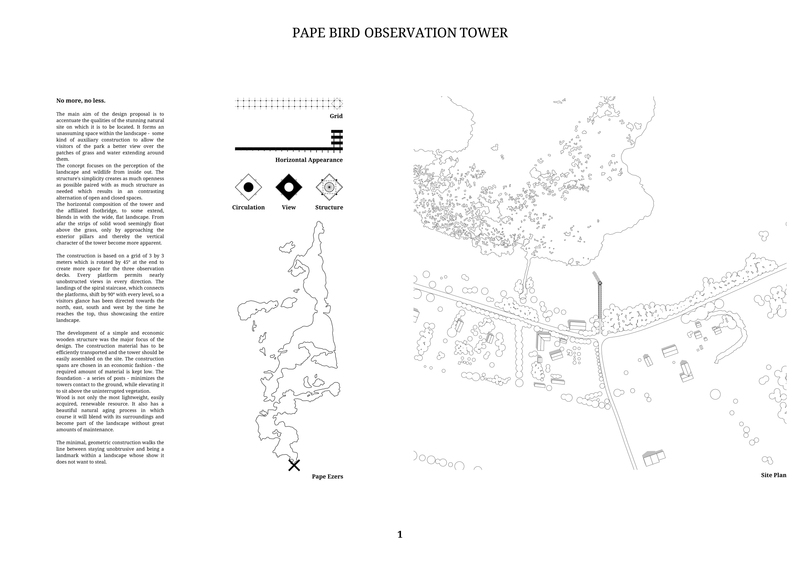 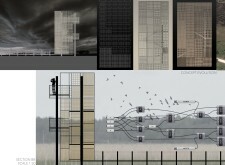 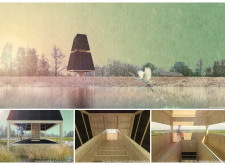 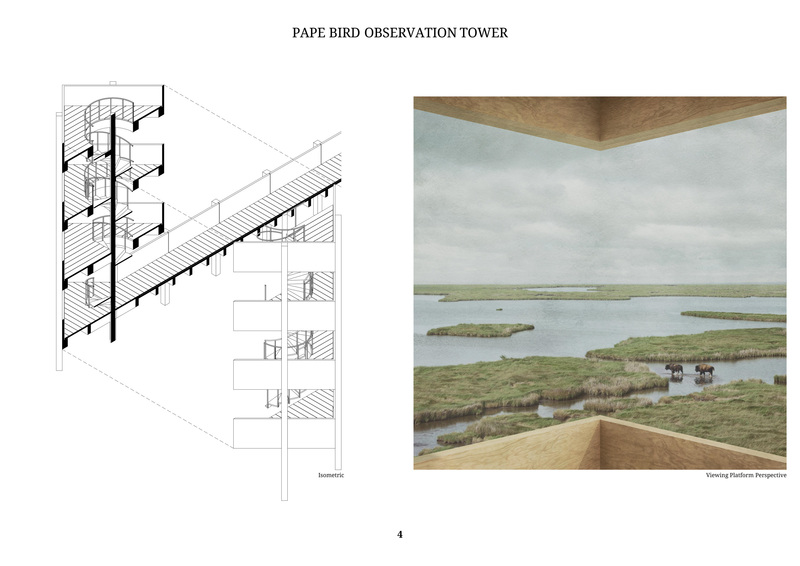 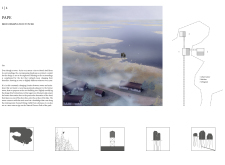 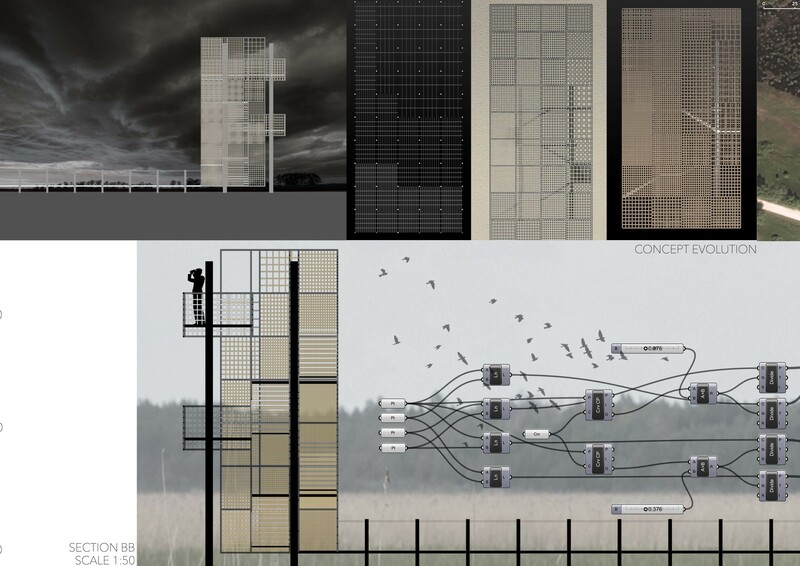 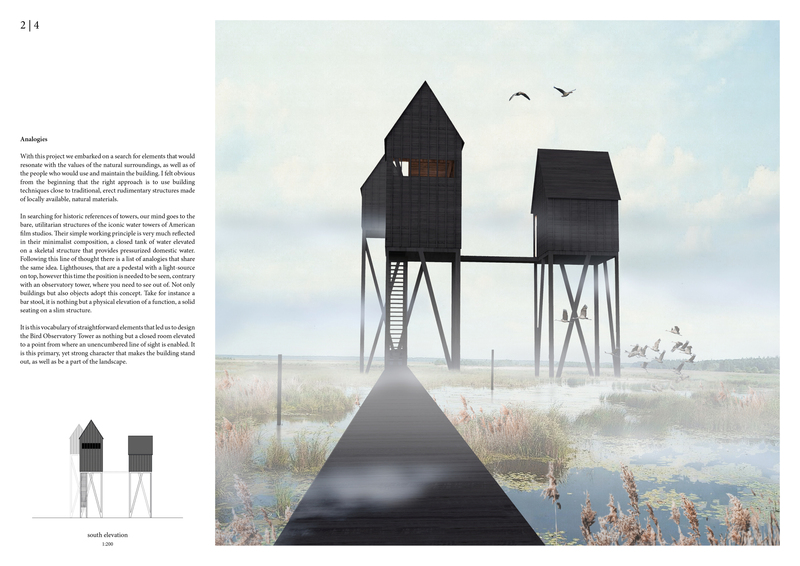 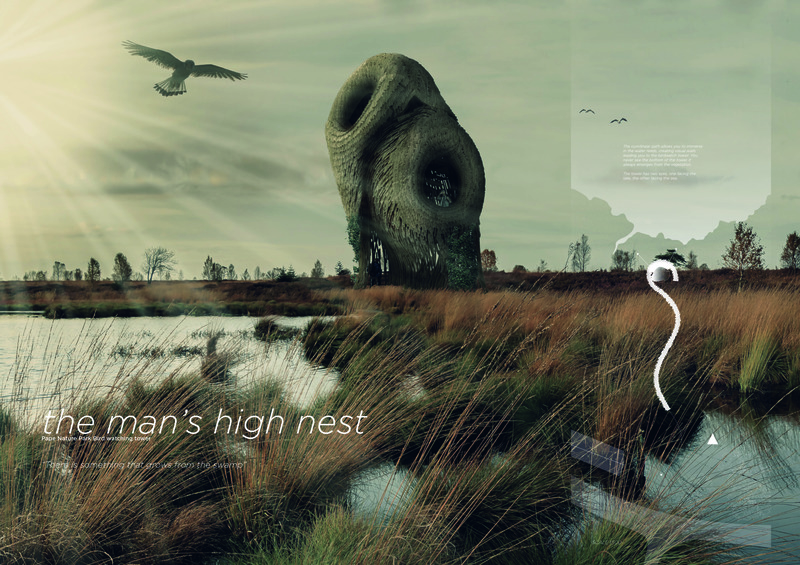 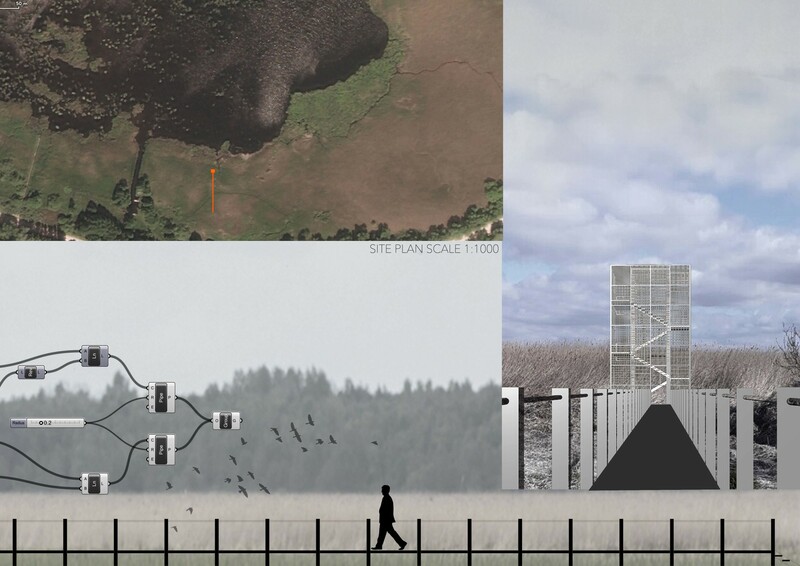 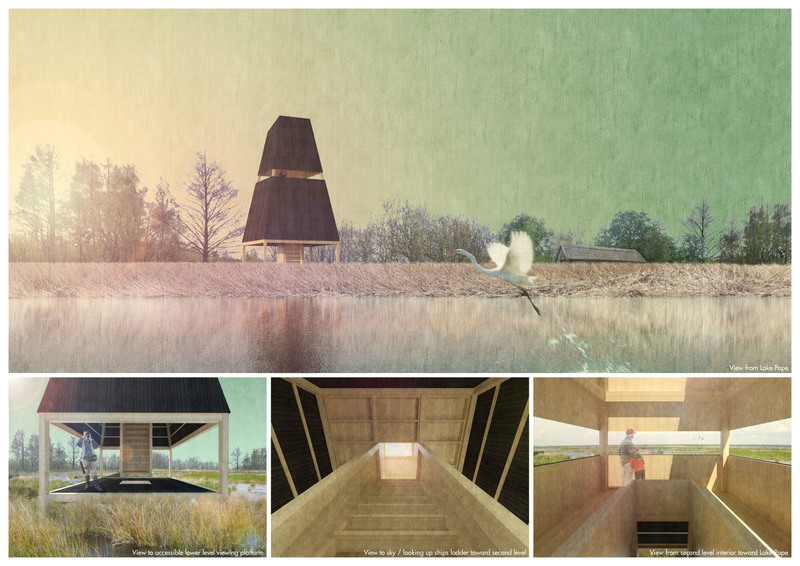 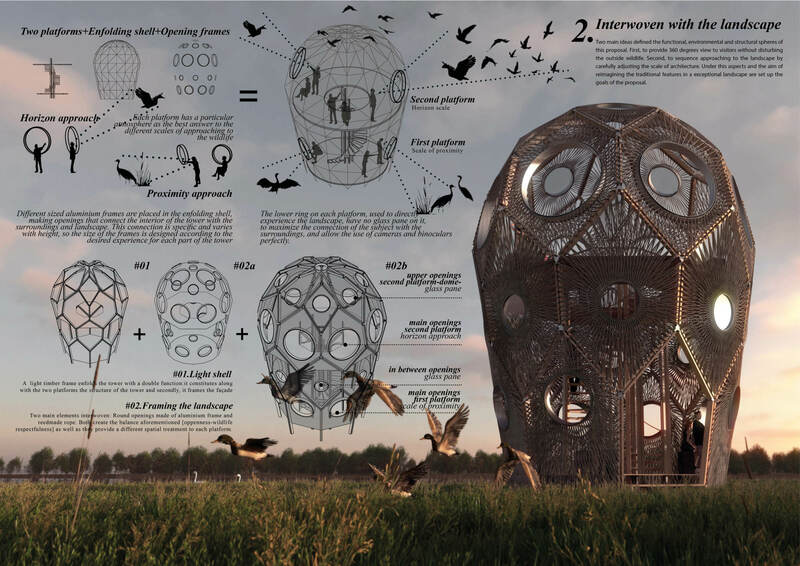 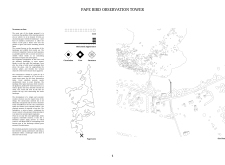 The Pape Bird Observation Tower competition is the first of a series to be organised by Bee Breeders in collaboration with the support of Pasaules Dabas Fonds, Latvia’s leading nature conservation fund. 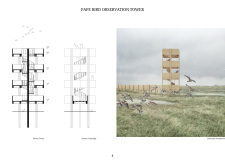 Here, participants were challenged with designing a new bird observation station, to replace an existing structure built in 1966 and destroyed by fire. 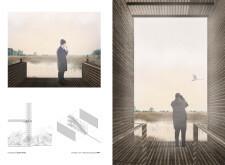 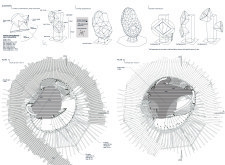 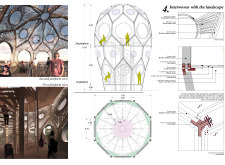 The jury evaluated entries based on a number of factors, including sensitivity to the environment, potential to serve as a landmark, functionality, constructability and economy. 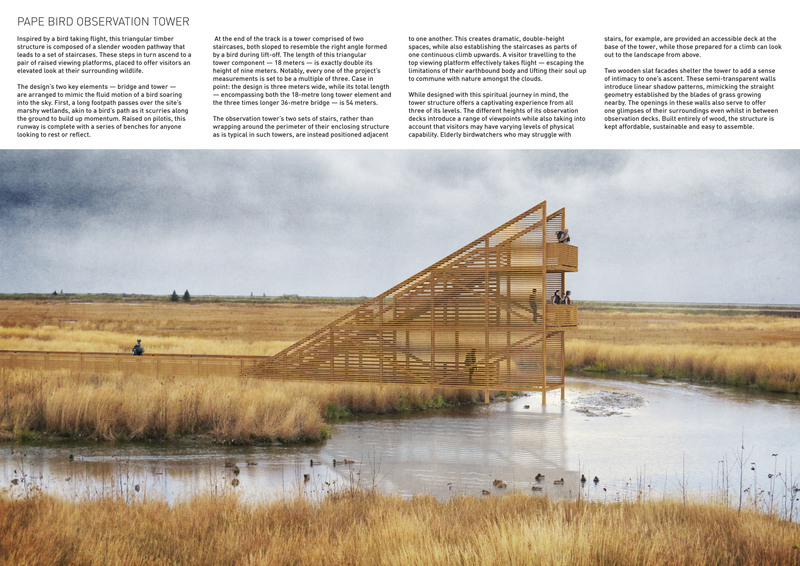 The observation tower will be used primarily to record annual migratory habits of an estimated 50,000 birds, as well as to allow park visitors the opportunity to observe the park’s natural resources. In this light the jury considered functionality and sustainability critical. 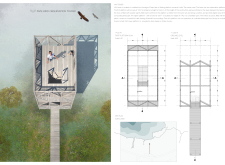 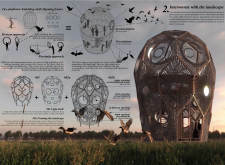 First, the proposed structure must permit users the ability to observe birds and other migratory animals in a manner that is simultaneously protective –visitors must be concealed to some level from frightening off animals – and open to 360-degree views. 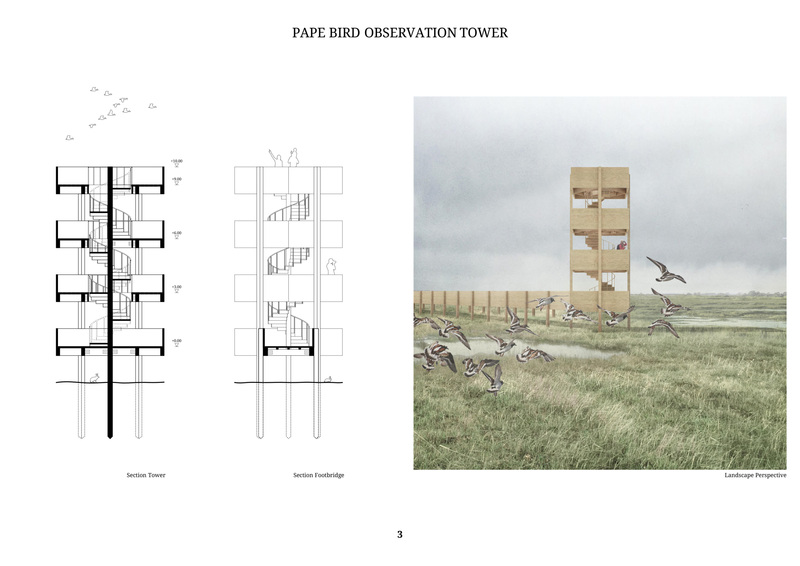 Second, the observation tower must have the capacity to be built with minimal disruption to the Paper Nature Park habitat. 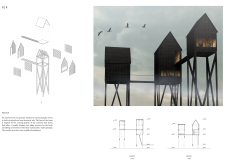 Participants were asked to follow strict size guidelines. 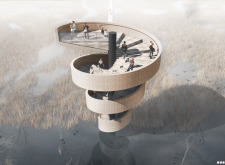 The observation tower must have a maximum height of 11m and at least two observation platforms. 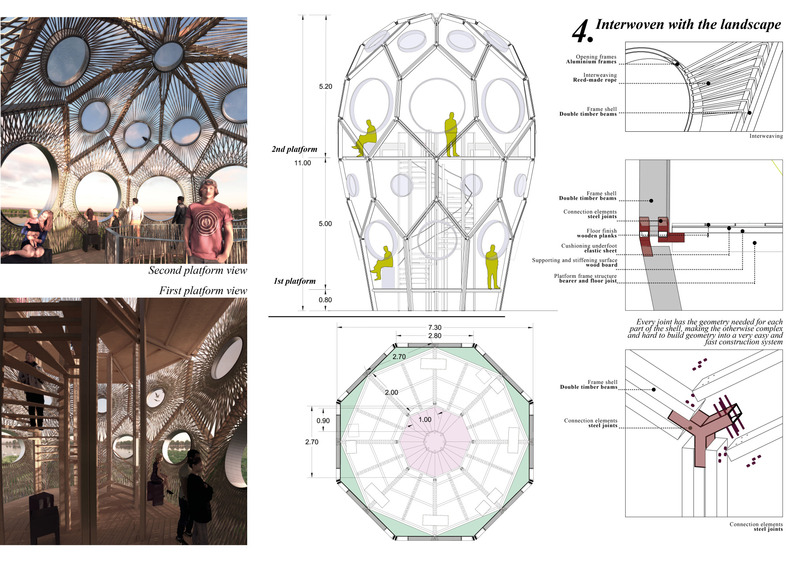 Despite these constraints, the jury found that entries proposed a wide and exciting variety of enclosure materials and structural forms. 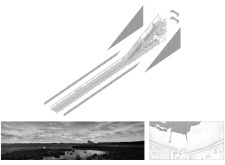 Modularity played a key factor in the majority of submissions, as did ease of construction within the difficult marshland setting. 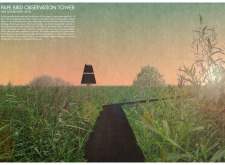 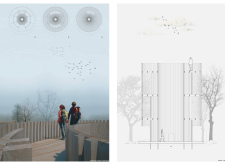 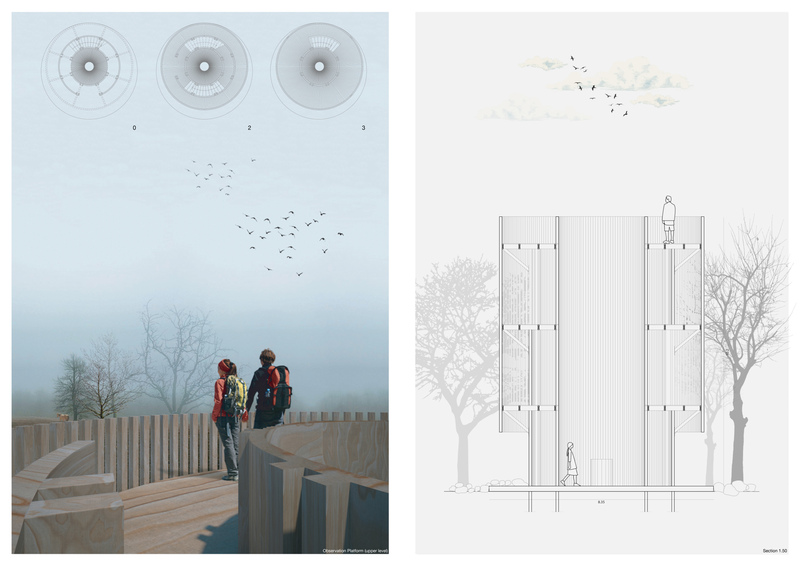 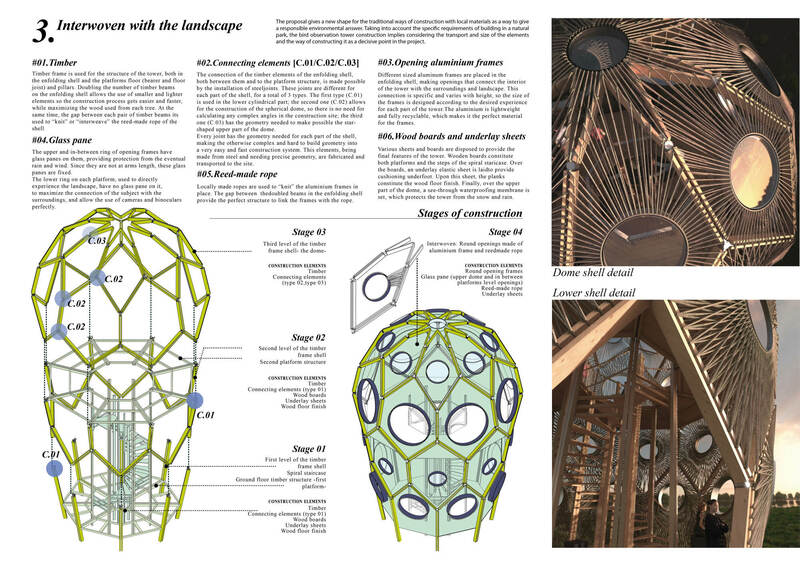 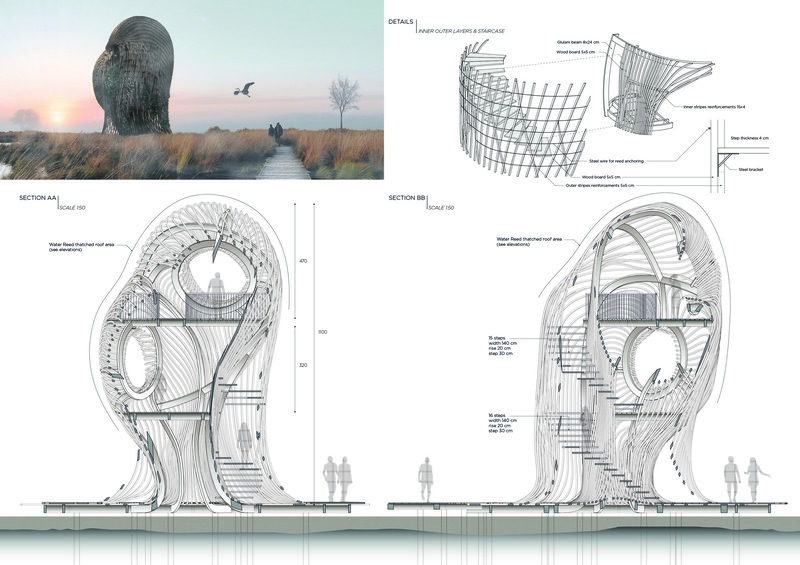 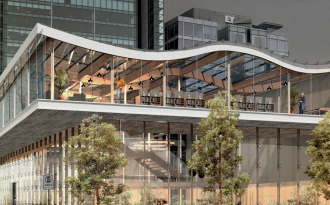 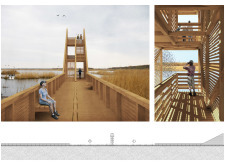 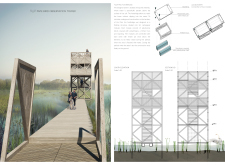 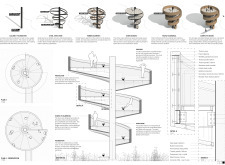 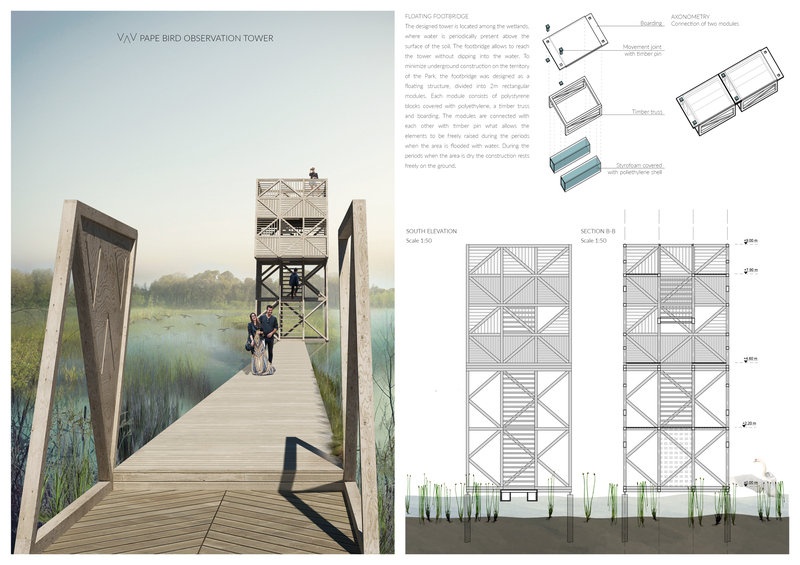 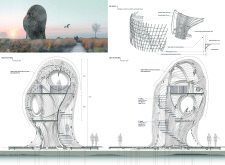 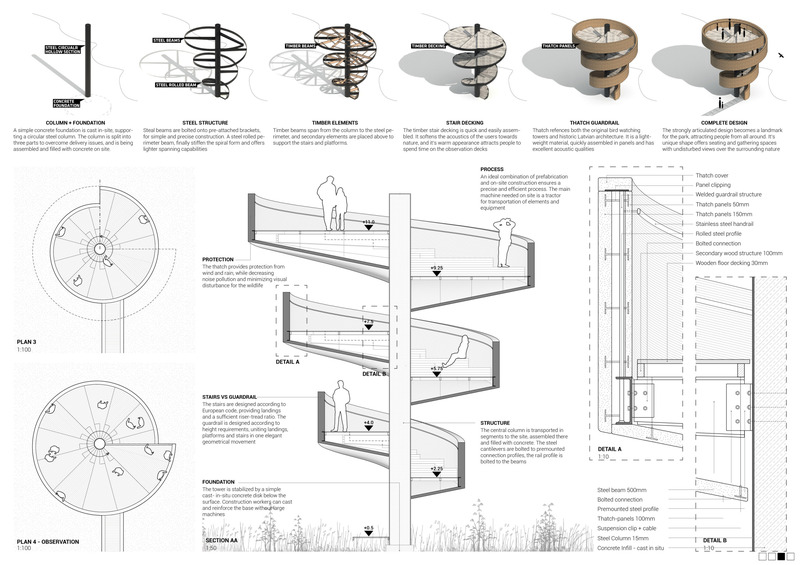 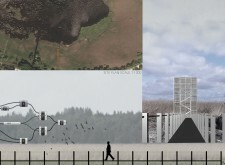 Designs also included a number of striking raised walkway designs for connectivity from the nature trail to the observation tower. Each of the winning entries has the capacity to become an important architectural landmark and observational tool for the park. 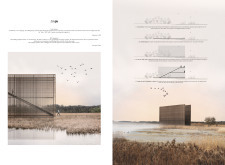 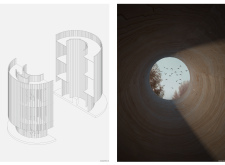 The high quality of the six honorable mentions reflects the outstanding level of work submitted across the board. 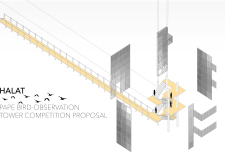 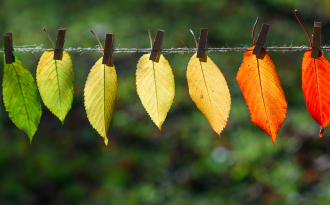 Bee Breeders would like to thank each entrant for their participation and hard work. 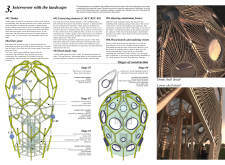 The form of this entry is simultaneously reminiscent of a bird’s nest and a jewel box – both of which bring to mind delicacy and intricacy, yet also protection. 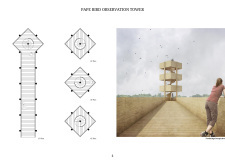 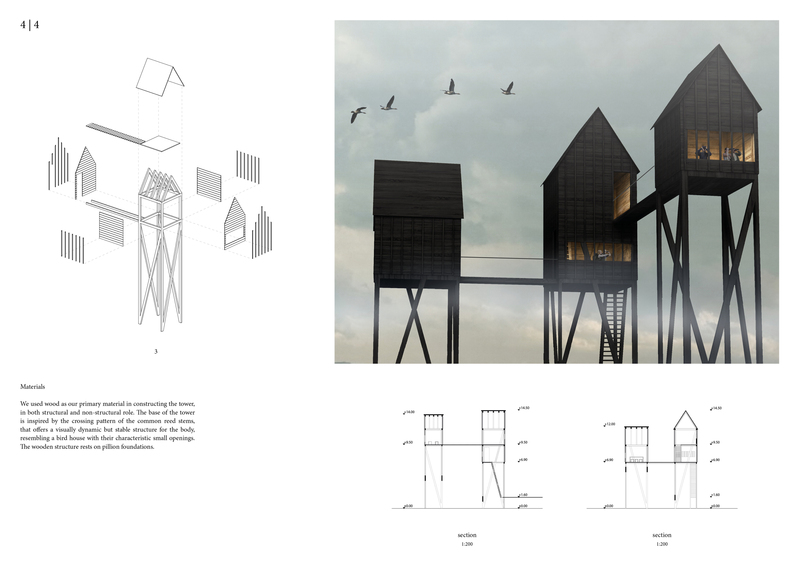 The jury was especially enthusiastic about the unique –and completely achievable – use of rope on timber frame as the primary element of enclosure. 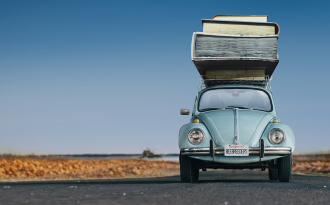 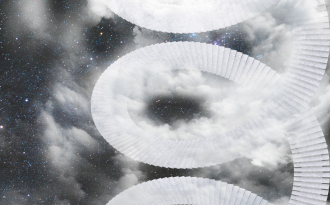 While the rope may require further density to achieve some level of concealment, it is a sustainable and economical material that is easy to transport. 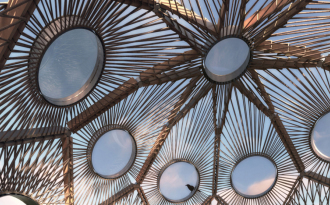 Fabrication of the project could be completed off or on site, allowing for easy construction and also straightforward maintenance or replacement. 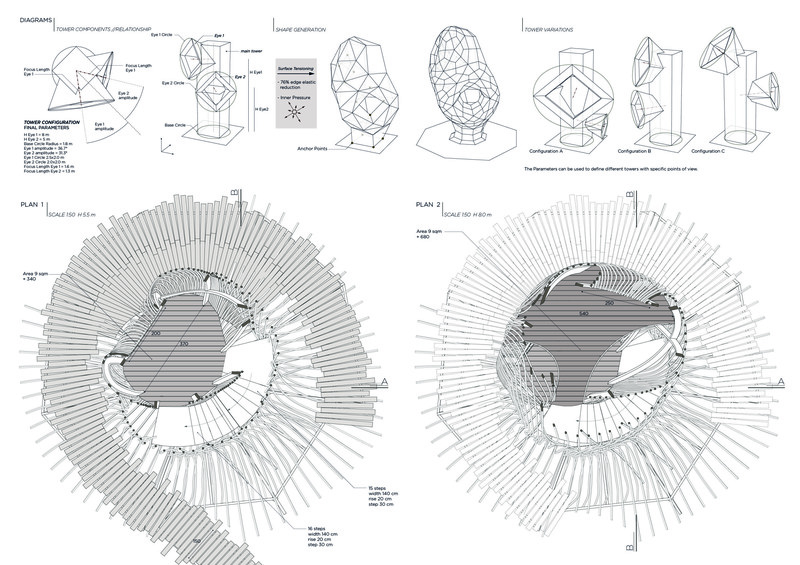 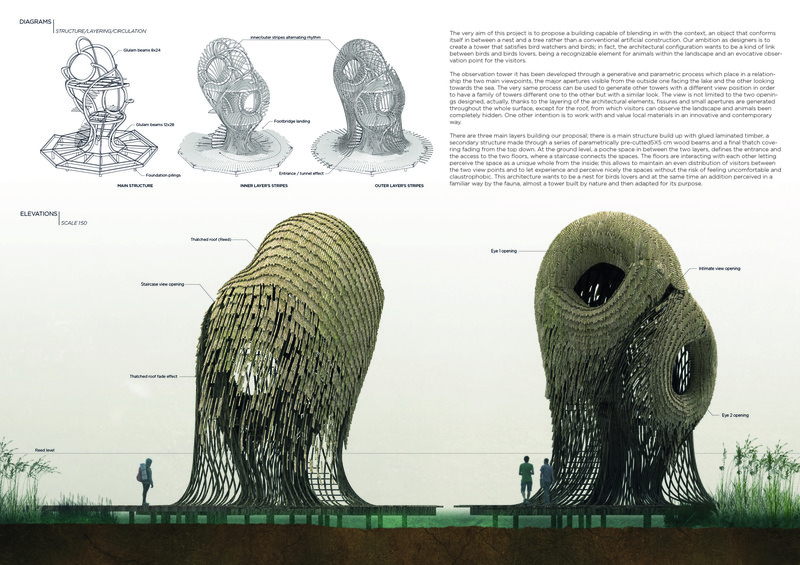 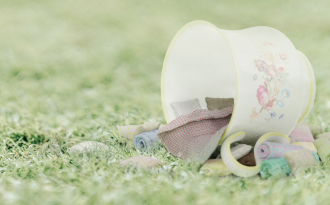 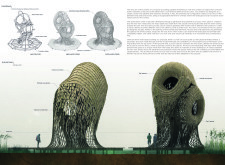 The design is among the boldest of the submissions to this competition. 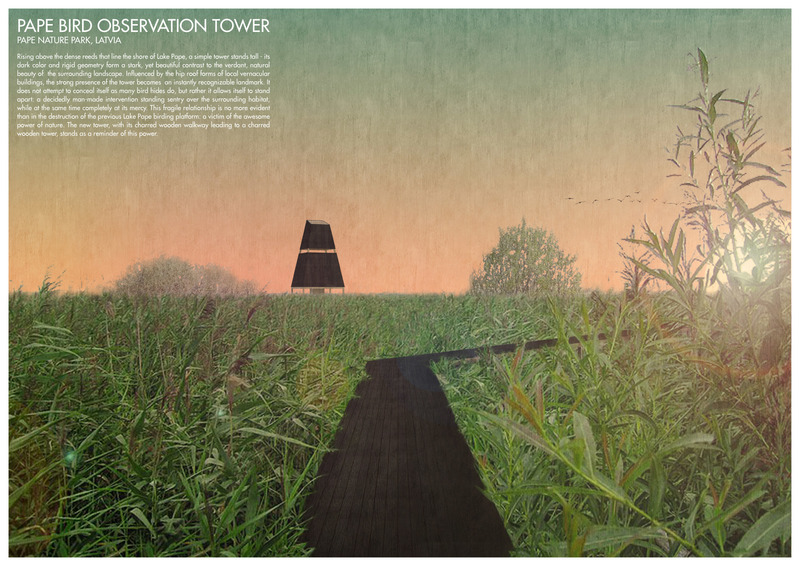 An important factor of parkland conservation is the necessity to share with visitors the wonders of nature, so that society, too, feels the need to protect its fragile and priceless resources. 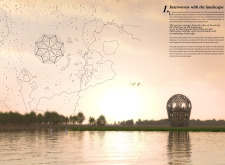 This project shows great potential to promote such interaction. 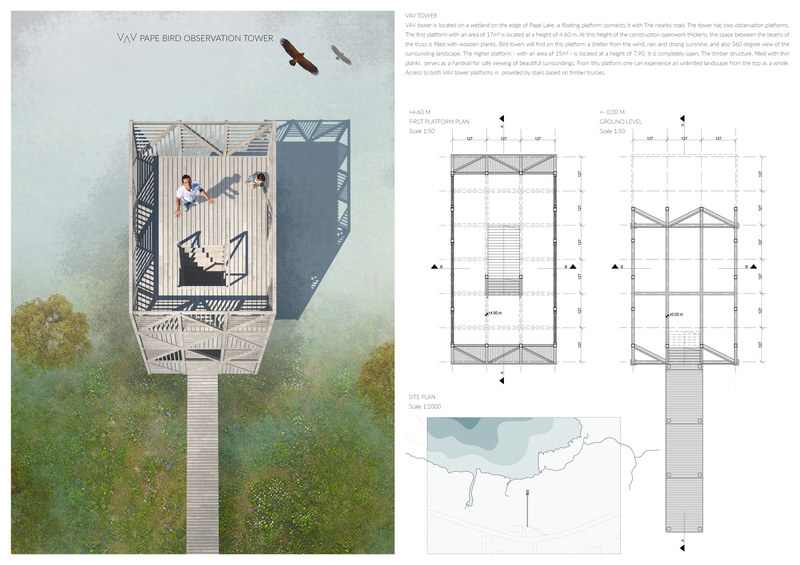 With eye-level panoramic views and built-in seating, the submission invites lengthy and comfortable visits, camouflaging users so as not to alarm flying birds or wandering animals on the ground. 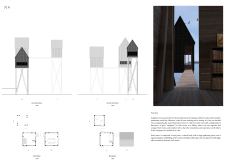 The jury feels it is unfortunate that the entry does not take advantage of the 11m height limit to permit views from this maximum elevation, yet it finds the design’s somber form and color, timber structure, and enclosure of burnt wood convincing and feasible. 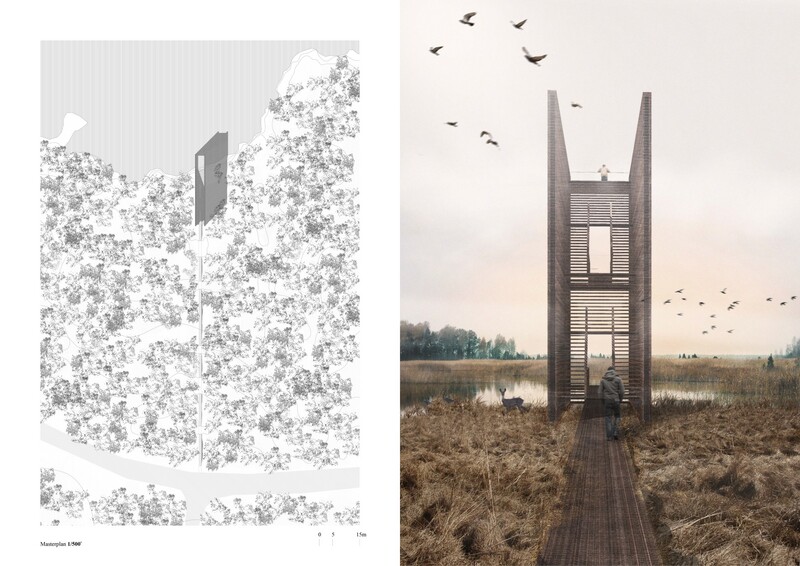 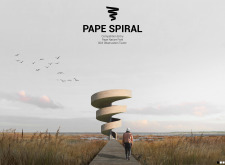 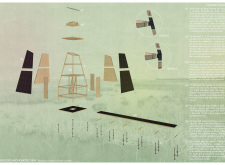 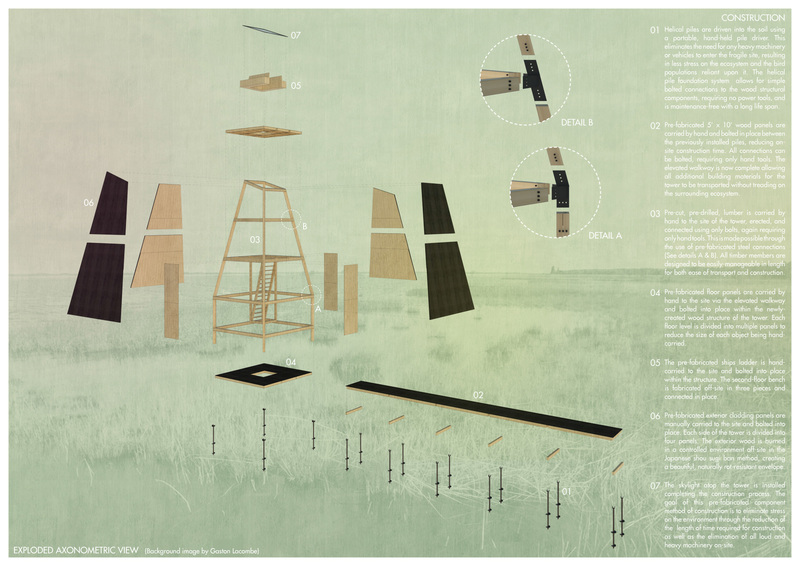 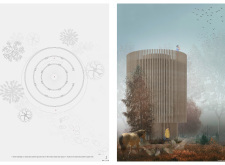 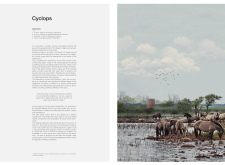 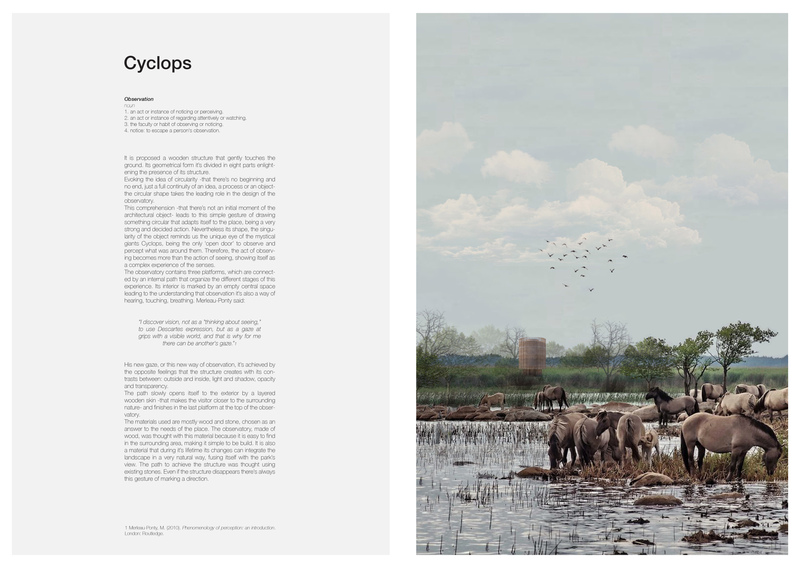 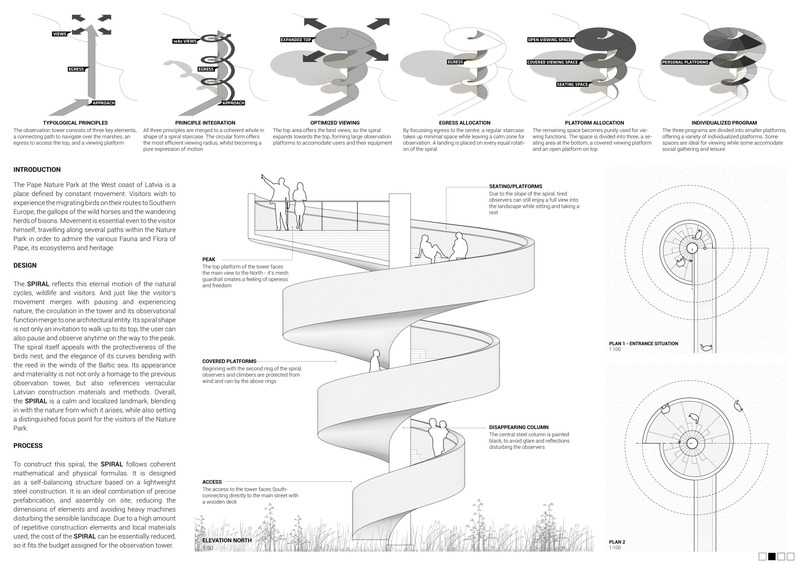 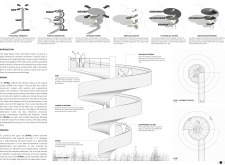 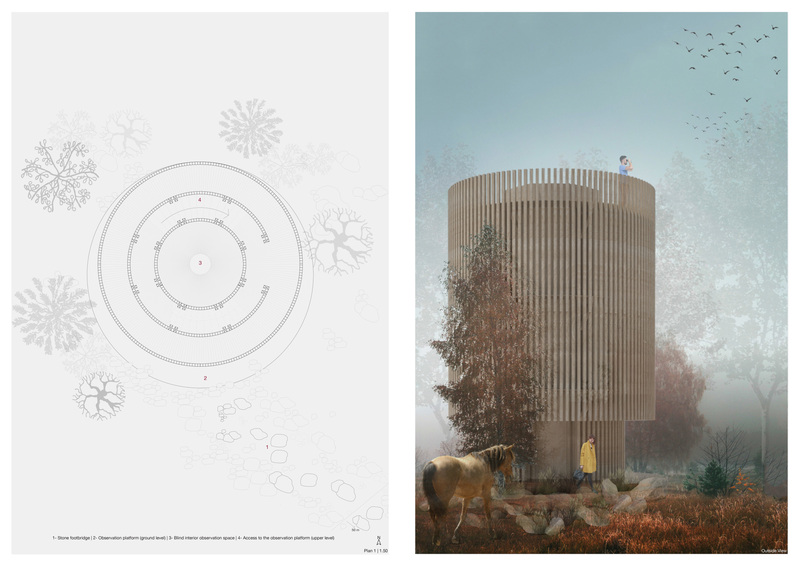 The submission’s graphics are exceptional in their simplicity – such austerity makes clear the project’s intention to function without being an impedance on the Pape Nature Park. 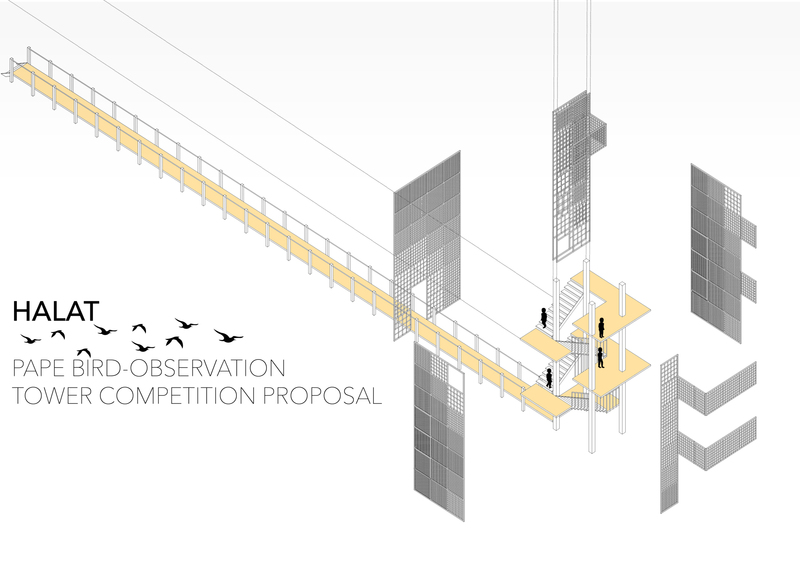 A ground level platform also shows sensitivity to observers who may not wish to climb to the level above. 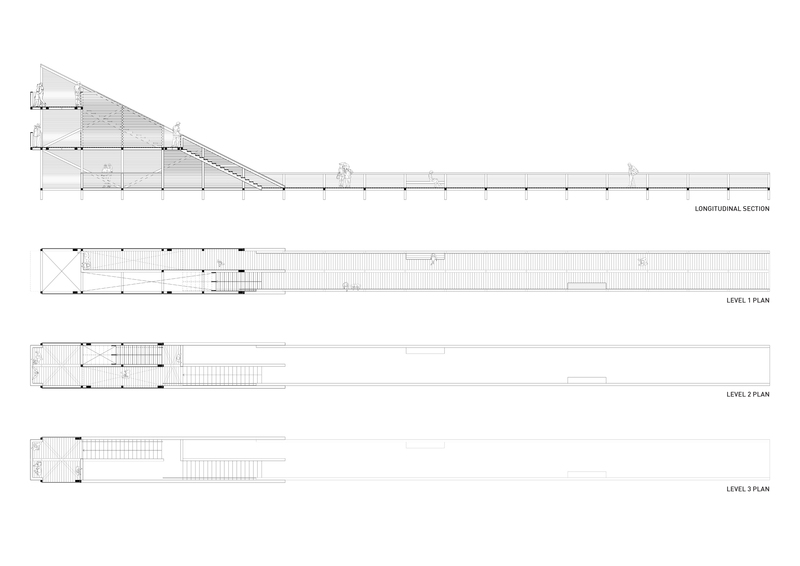 The design is comprised of two rectangular walls which appear opaque at acute and obtuse angles yet dematerialize at the perpendicular. 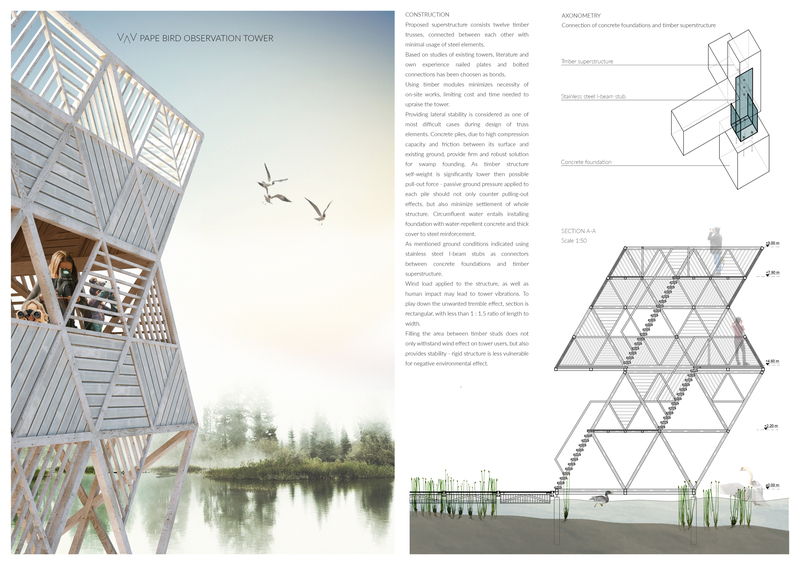 The overall effect is striking and functional. 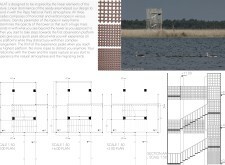 It allows for clear views to the marshlands at all points within the enclosure while also screening animals from easily seeing visitors. 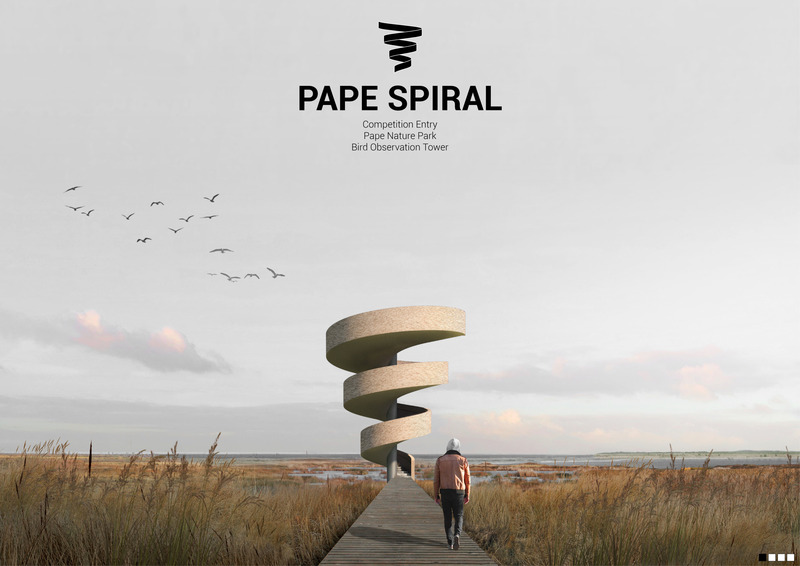 The form is powerful and offers multiple levels of viewing platforms. 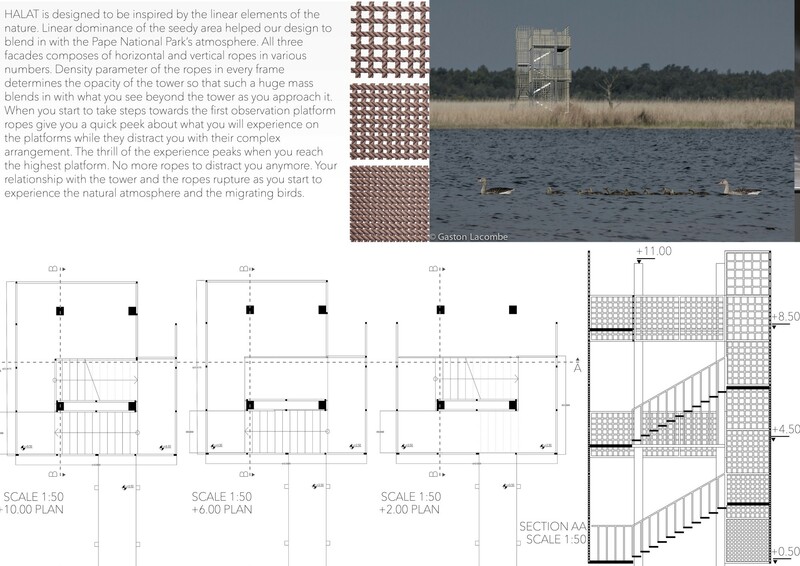 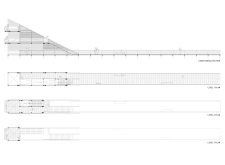 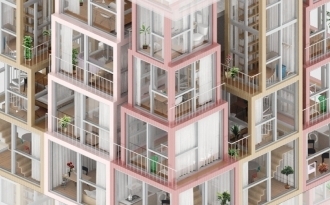 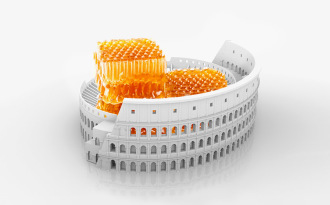 Construction sequence is not entirely clear in the submission drawings, but given the planar form of the building and use of metallic grilles as the primary building element, fabrication, modularity and structural integrity are not expected to be problematic. 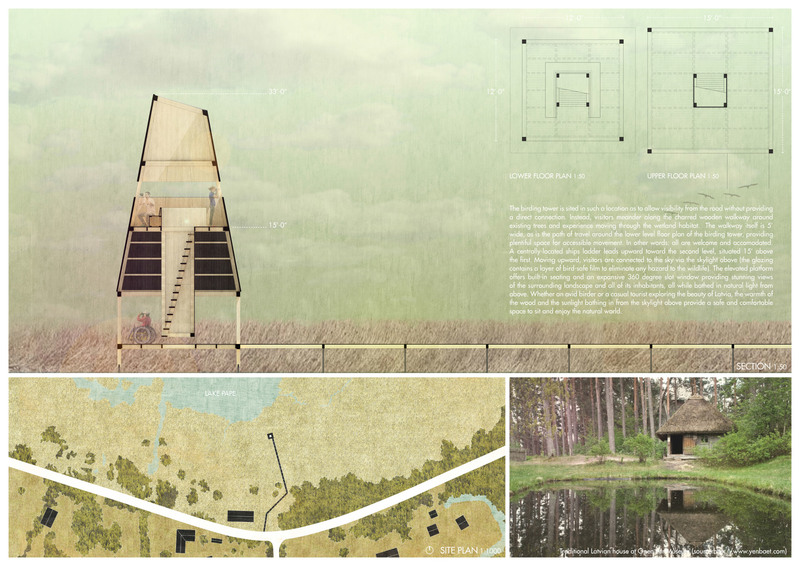 The entry shows great promise as a landmark within the park.